DELEGATION DELIVERS FREIGHT CORRIDOR MESSAGE IN DC - Alliance members participated in the 2017 I-69 DC Fly-In, stressing the importance of I-69 as a national freight corridor and urging members of Congress to adequately fund federal highway programs. A SUCCESSFUL I-69 DAY IN AUSTIN - The Alliance staged an I-69 Day in Austin, combining a workshop on eco development with a day of visits with members of the Legislature. JUDGE EMMETT SAYS COMPLETING I-69 IS CRITICAL TO TEXAS - Harris County Judge Ed Emmett believes I-69 is the most important economic engine in the entire state of Texas. GIWW DESIGNATED AS MARINE HIGHWAY 69 - The Gulf Intracoastal Waterway linking all Texas seaports is now designated as Marine Highway 69, clearing the way for seeking federal grant funds. This acknowledges teh connection between I-69 and the parallel waterway. SUPPORTERS STAGE DC FLY-IN 2016 - A Texas delegation was in Washington to continue the ongoing development of I-69. MEMBERS APPOINTED TO I-69 ADVISORY COMMITTEE - The Texas Transportation Commission has appointed 11 new members to the I-69 Advisory Committee. Harrison County Judge Hugh Taylor was elected chairman to replace Judy Hawley. I-69 IMPLEMENTATION STRATEGY TAKING SHAPE - An implementation strategy for continuing the development of I-69 is in place and is being refined by TxDOT. Judy Hawley presented the plan to the Texas Transportation Commission. I-169 IN VALLEY ADDED TO I-69 TEXAS SYSTEM - A 1.5 mile segment of State Highway 550 in Brownsville has been officially named I-169 and is now part of the Interstate System. CONGRESS ADDS SH 44 TO I-69 SYSTEM - StateHighway 44 from Corpus Christi to Freer (73 miles) has been added to the congressionally designated I-69 Texas System in the FAST Act of 2015. VOTERS SAY TRANSPORTATION IS A PRIORITY - The approval of Prop 7 by voters is further evidence that transportation is an essential priority for citizens who voted "yes" by more than 80%. 6.1 MILES ADDED TO I-69 AT EDINBURG AND ROBSTOWN - The FHWA has given final approval to add recently completed sections of US 281 and US 77 to the Interstate System. VOTERS URGED TO APPROVE PROP 7 - Editorial boards at the state's major newspapers are unanimous in urging Texas voters to approve Prop 7. VOTERS URGED TO PASS PROP 7 - Texas voters will get the chance on Nov. 3rd to approve Prop 7, a constitutional amendment that will dedicate more than $2.5 billion a year to highways. SIGNS UNVEILED ON BUSY I-69 IN CENTRAL HOUSTON - Local, state and federal officials celebrated the addition of 12 more I-69 miles to the Interstate Highway System in a cheerful but rainy ceremony along the Southwest Freeway near Greenway Plaza. ALLIANCE ISSUES FEDERAL AND STATE CALL TO ACTION - The Alliance for I-69 Texas has called for federal and state actions that will continue the forward momentum for development of upgrade projects on the I-69 system in Texas. PLANNING GROUPS URGE MARSHALL PROJECT PROGRESS - Three regional planning groups have jointly endorsed the I-69 route planning and community outreach efforts of the I-69 System (I-369) Harrison County/Marshall Working Group. I-69 SUPPORTERS PUSH FOR FEDERAL HIGHWAY BILL PASSAGE DURING 2015 DC FLY-IN - State and local leaders from the eight states on the Interstate 69 route were on Capitol Hill in Washington in April urging federal officials to continue the ongoing development of I-69. The large Texas delegation was lead by Transportation Commissioners Jeff Austin and Jeff Moseley. The group met with members of the I-69 Congressional Caucus. I-69 CONGRESSIONAL CAUCUS RETURNS FOR NEW SESSION - South Texas Congressmen Blake Farenthold and Henry Cuellar joined four colleagues in re-launching the successful bipartisan I-69 Congressional Caucus for the new 114th Congress. The caucus has taken on the task of educating other members of Congress on the importance of I-69. GARZA HONORED FOR SERVICE TO TRANSPORTATION - Cameron County Commissioner David A. Garza is the latest recipients of the Texas Road Hand Award presented by the Texas Department of Transportation. TWO NEW SECTIONS HEADED FOR APPROVAL - Two new sections totaling 6.1 miles will be added to Interstate 69 in South Texas once final approval comes from the Federal Highway Administration. The Texas Transportation Commission voted Nov. 20th to designate 1.6 miles of freeway under construction near Robstown in Nueces County as I-69E/US 77. A 4.5 mile section of new freeway on the north side of Edinburg in Hidalgo County was designated as I-69C/US 281. PROPOSITION 1 PASSES BY 80%; MORE PLANS TO FILL FUNDING GAP - Voters gave strong support in approving Proposition 1. State leaders are looking at other ways to help fill the state's serious highway funding gap. MARSHALL CONTINUES LOOKING AT I-369 ROUTE OPTIONS - More than 200 people came to an open house in Marshall to ask questions and view route options for the future I-69 system freeway. TEXAS EDITORIAL BOARDS ENDORSE PROPOSITION 1 - Newspapers around Texas universally encouraged voters to say yes to the highway funding constitutional amendment. INTERSTATE 69 WEST SIGNS GOING UP IN LAREDO - A day of celebration marked the unveiling of the first Interstate 69W signs in Laredo. A 1.4-mile section leading to the World Trade Bridge is now on the Interstate Highway System. 14 MILES OF I-69 UNDER CONSTRUCTION IN NUECES AND KLEBERG COUNTIES - Four freeway construction projects near the South Texas coast will add 14 miles to I-69E. The upgrades to US 77 have a total cost of $151 million. TEXAS GOOD ROADS GETS I-69 UPDATE - Alliance Board Chairman John Thompson provided participants at the Texas Good Roads annual conference in July with an update on I-69 progress. He discussed I-69's importance as a freight highway connecting to international border crossings, seaports and the huge Houston market. You can view his presentation slides [HERE] (8MB PDF). FIRST SECTION OF I-69 COMES TO LAREDO - The Texas Texas Transportaton Commission has given final approval to designation of a key 1.4-mile section of freeway in Laredo that has now been added to the Interstate Highway System as Interstate 69. The segment starts just north of the busy World Trade Bridge at the U.S./Mexico border and extends to an interchange with Interstate 35. SUPPORTERS UPDATE CONGRESS ON I-69 PROGRESS - Local leaders from five states along the national I-69 Corridor participated in a coordinated “I-69 DC Fly-In” this spring to meet with members of the I-69 Congressional Caucus and drive home the importance of continued progress on building out the entire interstate route. CITIZENS GROUP WORKING ON MARSHALL ROUTE OPTIONS - A working group of community leaders from Marshall and Harrison County have been at work for several months reviewing possible routes for the I-69 System to travel through or around the edge of the City of Marshall. Plans call for upgrades to the existing US 59 highway in most of East Texas. US 59 goes directly through Marshall and serves as a primary arterial in the community. BILL WOULD ADD SH44 TO I-69 PRIORITY CORRIDOR - U.S. Rep. Blake Farenthold has introduced legislation that would add State Highway 44 between Corpus Christi and Freer to the Congressionally Designated Interstate 69 priority corridor routes. The proposal has been championed by community leaders and the Alliance. The segment would begin at the SH 358 freeway near the Corpus Christi airport and run west for 73 miles. In the process it would connect all three legs of the I-69 system in South Texas. I-69 SHOULD BE PART OF NATIONAL FREIGHT NETWORK - MAP-21 requires that the U.S. Department of Transportation designate a "National Freight Network." The Alliance for I-69 urged communities along the route to submit commits urging the DOT to include I-69 as part of the designation. The bipartisan I-69 Congressional Caucus submitted a strong letter signed by a total of 24 Members of Congress. LAREDO CELEBRATES STEPS TO CONVERT LOOP TO I-69 - Interstate 69 champions join local, state and federal officials in celebrating the unveiling of new signage declaring that Laredo's Bob Bullock Loop will be the link between Laredo's World Trade Bridge, Interstate 35 and the western leg of I-69 in South Texas. The Texas Transportation Commission has redesignated Loop 20 as US Highway 59, a move that makes the loop eligible to be part of I-69. LAREDO LOOP OVERPASS OPENED TO TRAFFIC - The McPherson Road overpass project on Loop 20 on the north side of Laredo is now open to traffic as the contractor continues with final components of the project. It is the first of nine interchanges that will be needed to transform the loop to interstate highway standard. NICHOLS, PICKETT HONORED BY ALLIANCE AND GHP - The Alliance for I-69 Texas and the Greater Houston Partnership hosted a recognition reception Oct. 22 honoring the work of State Senator Robert Nichols (Jacksonville) and State Representative Joe Pickett (El Paso). They provided vital leadership in the 2013 legislature on Texas transportation funding. Together they developed and won passage of a measure estimated to increase highway funding by $1.2 billion a year if approved by voters. MULTI-STATE I-69 CONGRESSIONAL CAUCUS CREATED - Members of the U.S. House of Representatives from Texas, Mississippi, Tennessee, Kentucky and Indiana have joined to launch an Interstate 69 Congressional Caucus. I-369 SIGNS UNVEILED IN TEXARKANA CELEBRATION - Representatives from around the state gathered in Texarkana to unveil the first Interstate 369 signs as part of the I-69 system in Texas. US 59 from Texarkana to Tenaha in Shelby County will be designated as I-369 as sections are upgraded to interstate standard. VOTERS WILL DECIDE FATE OF $1.2 BILLION PER YEAR FOR HIGHWAYS - We provide a roundup of bills passed by the 2013 Legislature that will be impacting I-69 development in the future. This includes the constitutional amendment that will go to the voters in 2014 and could fill about a quarter of the current highway funding shortfall. COMMITTEES RECOMMEND I-69 ROUTES IN NACOGDOCHES AND LUFKIN - After a major public participation effort two local committees have made recommendations that will guide future design and environmental clearance for the I-69 Route through Nacogdoches and Angelina Counties. PLANNING STUDY GETS INPUT ON US 281 INTERSTATE UPGRADES - Open houses were held to give the public another chance to help plan the many projects it will take to upgrade US 281 to interstate standard in South Texas. This leg is being called Interstate 69 Central or I-69C. RIO GRANDE VALLEY CELEBRATES SUCCESS IN 20-YEAR QUEST FOR I-69 - Valley public officials, media, I-69 Alliance members and TxDOT celebrated placement of the first signs marking I-69 East, I-69 Central and Interstate 2. We have lots of photos. US 281 PLANNING STUDY UNDERWAY - Public involvement activities are underway on a feasibility study to determine what upgrade improvements will be needed to bring US 281 up to interstate highway standards in South Texas. 116 MILES ADDED TO I-69 SYSTEM; I-69 COMING TO TEXARKANA AND VALLEY - Final approval has been given to designation of I-69E, I-69C and I-2 in the Rio Grande Valley and I-369 in Texarkana. 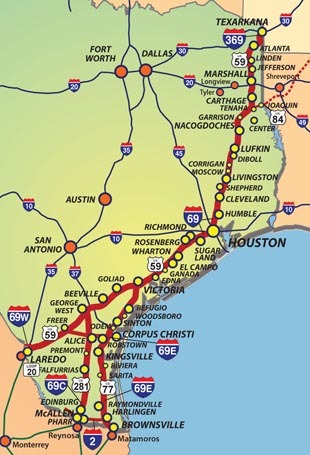 A total of 186 miles of Texas freeway has now been converted to I-69 and its connectors. FEDERAL APPROVAL FOR VALLEY INTERSTATES - Federal Highway Administrator Victor Mendez, while making two stops in the Rio Grande Valley, announced that FHWA had approved designation of three segments of I-69. IMPORTANCE OF FREIGHT CONNECTIONS STRESSED - A Texas delegation to Washington, D.C., stressed to federal officials in 18 meetings the value of I-69 as a freight corridor linking inland markets with seaports and Rio Grande ports of entry. SIGN CEREMONIES MARK NEW IDENTITY FOR SOUTHWEST FREEWAY - Leaders from Fort Bend County, TxDOT and the Alliance for I-69 Texas put up the first I-69 signs in Sugar Land and gathered to celebrate the milestone. NET RMA OPENS SECTION OF FUTURE CONNECTOR TO I-69 ROUTE - Lanes are now open on 26 miles of an outer loop around Tyler. It is part of Toll 49, a new highway that will eventually be a connector to the I-69 System. It is a project of the Northeast Texas RMA. MORE HOUSTON AREA FREEWAY ADDED TO I-69 - The Texas Transportation Commission has given final approval to adding 28.4 miles of US 59 to I-69. The designated area is from the south side of Rosenberg to Loop 610 West. CONSTRUCTION BEGINS ON LOOP 20 PROJECT IN LAREDO - TxDOT, local officials and Alliance representatives helped start construction on a new Loop 20 interchange. Loop 20 is part of the I-69 route in South Texas. TEXAS LEADERSHIP CELEBRATES I-69 PROGRESS - It was I-69 Day at the State Capitol and there were smiles all around celebrating the fact that more segments of the I-69 route are being added to the Interstate Highway System. I-69 ADVISORY COMMITTEE FINAL REPORT SETS PRIORITIES - After more than four years of work the I-69 Advisory Committee presented its Final Report and Recommendations to the Transporation Commission. We have the full report and photos from the presentation. ALLIANCE BACKS SEN. NICHOLS FUNDING PLAN - The Alliance has endorsed a proposed constitutional amendment that would dedicate part of the state vehicle sales tax to highway construction and maintenance. JUDY HAWLEY RECEIVES 2012 RUSSELL H. PERRY AWARD - Alliance Vice-Chair Judy Hawley of Portland was presentd the annual transportation leadership award. ALLIANCE CELEBRATES AS I-69 SIGNS GO UP IN HOUSTON - TxDOT has started installing dozens of new I-69 signs on and near the Eastex Freeway. The Alliance and others held an unveiling and luncheon to celebrate. We have pictures. 35 MORE MILES ADDED TO INTERSTATE 69 - The Texas Transportation Commission has taken the final step to add 35 more miles of I-69 to the national Interstate Highway System. The section is the first in the Houston area, extending from Loop 610 North to near Cleveland. FEDS APPROVE FONSI FOR US 77 UPGRADES - The Federal Highway Administration has issued a Finding of No Significant impact (FONSI) clearing the way for all upgrade projects on US 77 from Harlingen to Corpus Christi. I-69 IS ONE REASON TEXAS IS RANKED NO. 1 - The state is the No. 1 state as a place to do business according to a national study. NEW HIGHWAY BILL MEANS MORE I-69 SIGNS ARE COMING - The new federal highway bill will allow sections of the I-69 routes that are at interstate standard to be added to I-69 even if they are not yet connected to the existing Interstate System. COMMISSIONER AUSTIN DELIVERS I-69 SIGNS TO CAPITOL HILL - Full-size I-69 signs were hand delivered to Members of Congressand Senators for display in their offices. $153 MILLION ALLOCATED TO I-69 UPGRADE PROJECTS - An additional $153 million for 10 upgrade projects has been approved including a Premont relief route, a Loop 20 overpass in Laredo and improvements to US 59 in Victoria. TRANSPORTATION ADVOCATES SAY LOOK AT THE FACTS - The Transportation Advocates of Texas has published a simple Transportation Crisis information card as part of a public education campaign during the political season. TxDOT MOVING FORWARD ON 10-MILE SECTION OF I-69 - Another 10 miles of I-69 in South Texas is headed on the fast track toward reality. The Transporation Commission has started a process that will lead to expedited construction of the $60 million section south of Corpus Christi under a design-build contract. MAGAZINE HIGHLIGHTS I-69 INITIAL SECTION - A statewide magazine for those in local government reports on the ceremony celebrating the firs official section of I-69 in Texas. US 77 UPGRADE ASSESSMENT NEARLY FINAL - TxDOT has published the Draft Environmental Assessment on Upgrading US 77 from Corpus Christi to Harlingen. CELEBRATION MARKS FIRST I-69 SIGNS - A ceremony marking the first section of I-69 being added to the Interstate Highway System was a cold but festive event. FIRST I-69 TEXAS SECTION GETS FINAL APPROVAL - The final technical hurdle to putting up I-69 signs on the first section in Texas has been cleared. STATE APPROVES $89.8 MILLION FOR I-69 ROUTE UPGRADES - The Texas Transportation Commission has approved a list of projects on highway routes being upgraded to become Interstate 69. SHEPHERD RAIL OVERPASS IS KEY PROJECT IN I-69 PROGRESS - Work is moving along rapidly to bring 3.4 miles of US 59 up to interstate highway standard and move the highway away from a substandard railroad underpass. US 77 SECTION FIRST TO BE ADDED TO INTERSTATE SYSTEM - The Federal Highway Administration has granted a TxDOT request to add a 6.2-mile section of US 77 at Corpus Christi to the Interstate Highway System. I-69 signage has been ordered. MICA PLEDGES TO HELP SPEED UP I-69 TEXAS PROJECTS - House Transportation Committee Chairman John Mica told Alliance luncheon participants that the nation must figure out how to get projects done more quickly. MICA TO KEYNOTE ALLIANCE LUNCHEON - U.S. Rep. John Mica will provide an update on the proposed new transportation bill at an Alliance luncheon Aug. 11th in Houston. LAWMAKERS HELP FACILITATE I-69 PROJECTS - Cities and counties will get expanded powers to establish transportation reinvestment zones and build highway projects under new legislation. BROWNSVILLE, ENCINO PROJECTS FUNDED - TxDOT has approved pass-through financing arrangements that will allow two South Texas projects to move forward. FALFURRIAS EXPRESSWAY PROJECT PASSES HALFWAY MARK - Construction work on six miles of interstate standard highway on US 281 at Falfurrias is moving forward. CONGRESSIONAL ACTION SOUGHT FOR I-69 SIGNAGE - Legislation backed by all members of the Texas delegation seeks to authorize signage and add US 83. ROBSTOWN, BEN BOLT PROJECTS WRAPPING UP - Two more upgrade projects on the I-69 route in South Texas have been opened to traffic. NOTICE PUBLISHED OFFICIALLY ENDING TTC PROCESS - The official notice has been published in the Federal Register. ALLIANCE BACKS CAMERON COUNTY RMA PROPOSAL - The Alliance Board has pass a resolution supporting the RMA's application for pass-through financing of I-69 projects. ALLIANCE SUPPORTS TXDOT DECISION TO FOLLOW EXISTING HIGHWAYS - Alliance members react to TxDOT move to abandon wide corridor on new terrain. TXDOT RECOMMENDS NARROWING STUDY AREA FOR I-69 - TxDOT press release explaining the decision to drop plans for the controversial Trans-Texas Corridor concept on I-69. 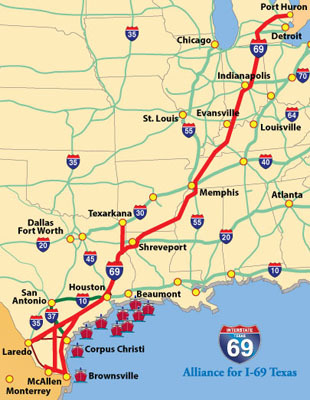 I-69 system in Texas runs from Texarkana to Laredo, McAllen and Brownsville on the Rio Grande. The planned national I-69 route leaves Texas on US 84 at the Sabine River. Each state on the route is responsible for highway development within its borders. The route includes a proposed new interstate standard bridge across the Mississippi River in Desha County, Arkansas, and Bolivar County, Mississippi. In the Rio Grande Valley, U.S. 83 is now Interstate 2, a designation that was made possible because sections of I-69 were added to the Interstate Highway System. I-2 is a critical connector and the Alliance considers it to be part of the I-69 System in Texas.